Model Thinking Sketch Notes: Why Model? 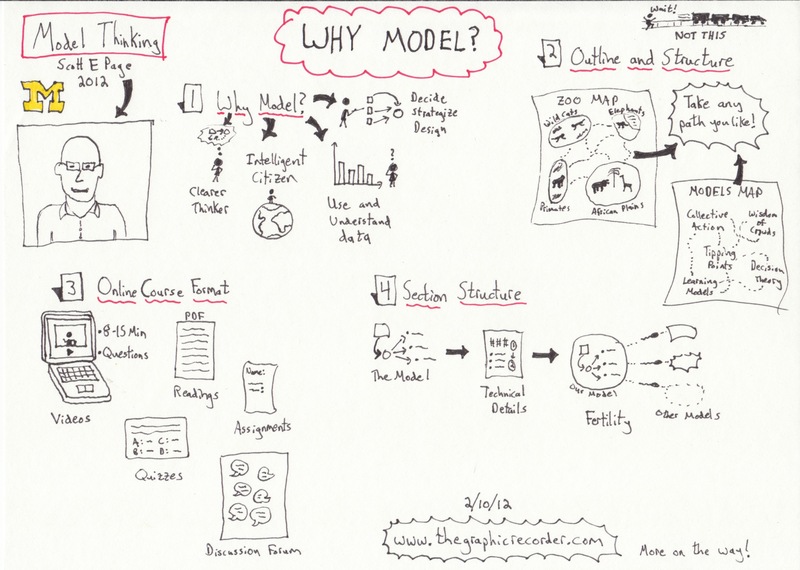 I am excited for the upcoming Model Thinking course for many reasons. First, because of the format: it is online, free, and collaborative. Second, because it will strengthen my ability to use modeling as a teaching tool in science and math courses. Third, because it will give me a chance to practice graphic recording in the context of a “formal” learning environment. And finally, because of the inherent connection between model thinking and graphic recording. I want to delve a bit deeper into this last reason. I view graphic recording as a way to take an idea and create a model of it – a model that shines light on the inner workings of that idea. In the same way that models make complex systems easier to understand, graphic recordings make complex ideas easier to understand. While I anticipate being interested in the specific models that will be addressed in this course, I hope to also be able to apply what I learn to the craft of graphic recording. Who’s ready to learn with me?